Home » Blog » What is bullying and how you can deal with it? Bullying affects millions of young people every year, and anyone can be bullied. 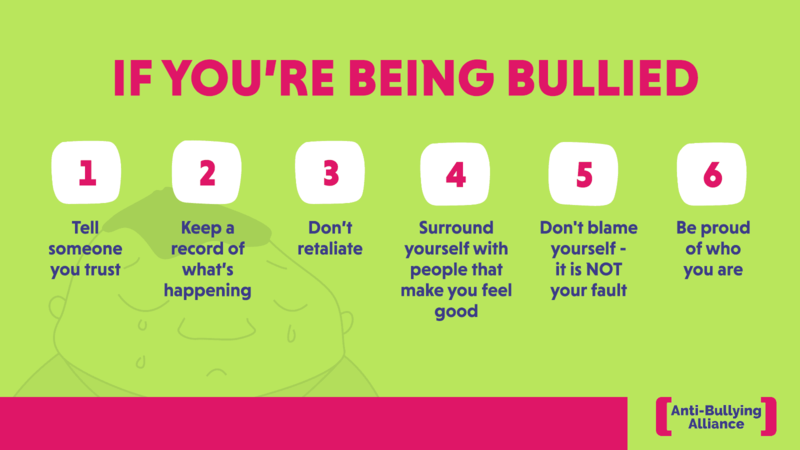 Here’s what you can do if you’re being bullied. The Anti-Bullying Alliance defines bullying as the repetitive, intentional hurting of one person or group by another person or group, where the relationship involves an imbalance of power. It can happen face to face or online. Bullying in student accommodation is no different to bullying in any other environment. For most students living in halls, it may be their first experiences of communal living and sharing facilities with others and tensions may arise. You may encounter differences in living styles and personality clashes with those you have been allocated to live with. Sometimes these clashes will go away as people set in and learn to live with each other however, if you feel that behaviour towards you is upsetting you and affecting your university experience it’s important to speak to someone and make the situation known. How bullying can affect you? Some people who are being bullied develop depression, anxiety and eating problems. They may self harm or turn to drugs and alcohol. If you are experiencing problems like these because of bullying, it’s having an impact on your health. The residence’s on-site team and our team at Find Digs are always here to help, feel free to speak to your residence manager or e-mail us at admin@finddigs.co.uk we will keep any information confidential. Bullying in any form is hurtful and unacceptable, don’t let it make your life miserable. There are a number of things you can do if you feel you are being bullied or harassed in your accommodation. Ignoring bullying won’t make it go away. Firstly it is important to remove yourself from the situation in the first instance: do not be tempted to retaliate. In the event of any case of bullying, collect any evidence and document incidences. Any witnesses or bystanders to matters of bullying and harassment may also be happy to provide evidence via a statement in the event that you raise a formal complaint. Tell someone! Initially, choose somebody to tell that you feel comfortable confiding in, whether this is a friend, family member. You can contact the Find Digs team to report incidences of bullying and receive advice and support about your options. You can also get in touch with your Student Welfare Officer at your university. If you feel confident enough you may wish to approach the person(s) involved to let them know how their behaviour is affecting you then you can, or you can do this with the support of a friend. You never know, they may not be aware that their behaviour is causing you offence or is intimidating and sometimes this can help to stop the behaviour. However, we do know that this is not an easy thing to do yourself. If the bullying is happening online – you can report abusive posts on Facebook and other social media platforms. You can also report abuse to CEOP (Child Exploitation and Online Protection Centre).